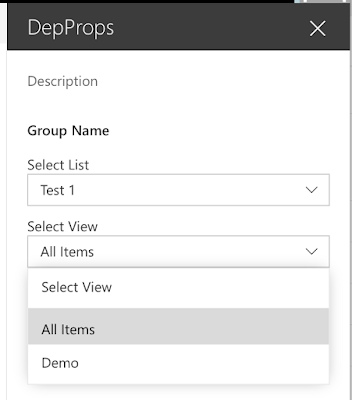 Tricky SharePoint: SPFx. Client Web Part Property Pane Dependent Properties. Part III: Styling Dependent Properties Control as Office UI Fabric dropdowns. Knockout version. This is the last post of three that explain how to add dependent properties to Client Web Part Property Pane. This post describes creation of custom Knockout bindings, custom Knockout components and styling your components in Office UI Fabric manner. In previous post we created a custom field that consists of two dependent dropdowns. Everything works good but looks not so good. It would be much better if our dropdowns look similar to Office UI Fabric Dropdown. Unfortunately there is no Knockout version of Office UI Fabric Dropdown and a Dropdown from Fabric JS is pretty static - it creates <ul> markup based on a <select>. But if you change something in your select dynamically it won't reflect UL until you recreate the Fabric JS dropdown. So let's create our own Knockout.js component styled as Office UI Fabric Dropdown. You can find documentation on Knockout components here so I won't spend time to describe it deeply. In few words we need to create a view, a viewmodel and register the component to be able to use it in our app. This is how our view should look. LI elements will be created dynamically based on options property. The only thing we need to decide is how to implement inserting of optionsCaption dummy item before options in the dropdown. There are two ways for that. First one is to implement the logic in viewmodel: get options array and insert a new element there which will have optionsText as text, -1 as value. And in the view we can use simple for binding to iterate through the items and create li elements for each of them. Second one is to create a custom binding similar to out-of-the-box options binding. I selected the second option to practice in custom bindings. msoptions, optionsCaption and itemSelected parameters are handled inside created custom binding. As you can see there are some methods in the binding (onOpenDropdown, onItemSelected, isOpen, disabled). All these methods should be implemented in a viewmodel. So let's create the viewmodel (/webpars/depProps/components/dropdown/viewmodel.ts).